Featuring An All Star Cast! An awesome blog with a plethera of facinating information. and you have to clean it up! MY WISH LIST Yes, you can buy my silence or just get me something because you've enjoyed my blog content and feel guilty for reading it for free. You can even buy me something if you hate my blog - your punishment in this way is more than I can stand. Or, you can just look through and wish along with me. I been away. I been doing stuff. Stuff. You know - stuff. You want me to spell it out for you? S-T-U-F-F.., Stuff. laymans terms next time and less lengthy. I been sick - then got better. No more loose snawt running out my head like a water faucet wide open. I guess I am ok - other than the back pain. I will live. Just thought I would tell you so you didn't take on that "Is Daveman Dead, Pool" thats been going around. I just haven't felt like blawging in a long while. I would like to want to and want to feel like it - but if the barometer isn't forecasting anything it just isn't coming out. Know what I mean? No? Me either. The only thing I have felt like doing is singing my brains out - which reminds me I am still trying to learn Buddy Holly's "Peggy Sue" sawng. I can sing just one or two of his diddies but his others are hard to follow. I am nawt a professional people - so I wont be holding any concerts at Madison Square Gardens any time soon. Thats just the way it is. FYI - New Movie Released This Month- A friend of mine's daughter is co-starring in a new direct to video film starring Bruce Campbell "MY NAME IS BRUCE"
Bruce has independently produced, directed and acted in this extension of the "Evil Dead" series of B-Movie films - he also currently co-stars in a USA Network Tv Series called, Burn Notice". All the Evil Dead series are not what you would call block buster material but has a huge fan base - and is funny - when blood isn't gushing like old faithful - so I don't recommend this as a family film - unless of course you happen to be Rednecks that don't give a crap what your kids see. 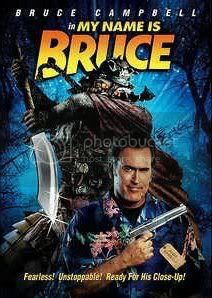 In this film - Bruce Campbell portrays himself and is mistaken as the character he plays in the Evil Dead series where he kills demons like one does swatting flies or butchering hawgs - well - maybe not like butchering hawgs.., ok.., maybe like butchering hawgs - whatever - but anyway a small town is over run by demons and a couple of redneck fellas kidnap Bruce to get him to slay the demonic infestation. Or at least thats what i heard. He keeps telling them I'M NOT NASH! MY NAME IS BRUCE!!! Anyway I hope to see this movie - I am a fan of his - I am not real into gore but the sophomoric humor and wit has always been the chief trademark of Mr. Campbell - and thats what draws me. Ya wanted an update? Thats an Update. SEE THE MOVIE and give Grace Thorsen - a relatively new actress, support. She has a few movies under her belt and from what I understand - very talented! Very pretty actress at that. My buddy is obviously very proud of his little girl, cant says I blame him. He himself has played with a few well known bands - not in concerts but just guys kicking around with friends at each others houses, and so on. He's an oddball but a good oddball like you and me. Cept different - LOL. naw he's a good joe, cept his name aint Joe, its, Ron. Duh! Consider this an update - yew has been warned Way after the fact. Love yall - and I really do miss you peeps. I seem to have lost the old magic - that thing what made me tick. Its mind blowing (at least for me) to look back at my ancient writings and look at the now and recent stuff. I think Sam and I are kindred parrots, in our reasonings. In fact I know the very woman he speaks of! The poor woman no sooner than she got home from the hospital with one bundle of joy - she was loaded for bear and back in the game emediately. I can stop her! All I got to do is resort to plan (A) and keep them (hubby & wife) seperate. Plan (B) the backup plan.., lets just say her husband could have gainful employment in the ancient Middle East during biblical times as a Eunic. I'm not against people having large families... nay. Early America owes itself to large families. I just think the woman needs a break in between harvests. But then again, if she can deal with and likes that program of being a, one woman baby manufatcuring plant - I'll not stand in the way of her ambitions. Unless of course I was married to her, and then I'd have plenty to say..., "Look dah-lin.., if you can work extra jobs while birthing all them kids, and raise everyone of them yourself at the same time, have all you like." TODAY's SAFTEY TIP: Wear a glove, gents! Peas At Last! Peas At Last! One Doctor, P.E. Mehoff, studied peas for years and discovered most every kind of pea is good for you and also discovered goober peas (aka peanuts) float in the water. He caused a stir when when his assistant yelled to him, "But sir! You cant take a pea in the pool!" The public swimming pool came alive with everyone thrashing to get out of the water and a concerned life guard yelling through the mega-phone, "Get out of the pool! For God's sake people evacuate the pool!". There was a small fine to be paid and lots of explaining to do. Dr. Martin Luther King was quite fond of peas as a staple food. He even worked it into a famous speech, declaring, Peas at last! Peas at Last! but some dirty hippies misconstrued the whole thing into what most people think he said today. The power of suggestion is a healthy nut for sure. And just when you start to doubt history now..., I cite that ex-beatle John Lennen wrote a song about peas too - "Give Peas a Chance". Yeah I heard you groan on that one but its true! How do you know? BECAUSE I SAID SO and thats good enough darn it! Don't pea me off! There are many historic changes such as these. Why? A conspiracy from PEA HATERS! Thats right! There are people who hate peas so much they manipulate history to achieve their nefarious activities. Its secret society known as "Hull and Scones", which I am guessing they hate scones too. President Bush and President Obama are members of this evil society as well and when they say "Peace" - they are going all out to avoid use of the word "peas". Ok - I thats all I got to say about that. But I do leave you with this notation; Give peas a chance and you will have peas at last, peas at last! Just don't ever take a pea in the pool. Ok? Nuff said. Good night! Its with great sadness my invisible cat, Fred, has passed away. I'm not sure but I think he had a rare genetic disease that attacks invisible cats; Invisibiana Fofanna Botanna Mommaniplubis or something like that. Fred was given to me by my Extraterrestrial friend, bob, who quite frequently inquires about Lady Fri.
Poor Fred apparently has been ill for some time, I just didn't see it coming. But he is at rest now, in his invisible grave and I spared no expense in providing a beautiful invisible tombstone. Too bad you cant see it. The service was attended by just me and bob. bob sang a strange version of Blowing In The Wind with a near perfect Tom Petty impression, dressed as Elvis - Fred liked Elvis. Tom Petty, not so much. He peed on the Tv once when Tom Petty was on some special concert I think. So now I have to locate Fred's invisible water & food bowls. I purchased them at the Invisible Pet & Pet Supply Store on the INTERNET. Has invisible check out clerks, really unique. Don't bother looking it up, you wont find it. Anyway - when I got the package I could have almost sworn that there was nothing in the box but air till the Customer Care division explained the bowls were invisible and as light as air - they even gave me five invisible bottles of invisible water and 5 boxes of invisible dry cat food - which always replenish themselves. I know what you're thinking - if they are self replenishing, why the extra bottles of water and boxes of food? Hey, I figure they are losing money and it didn't cost any extra so I am not complaining about it. I may post pictures of Fred as soon I can find them. Assuming I can find them. After all I had to use invisible film. Thank God for digital cameras! I'm glad I purchased the invisible film for my digital camera too, by the way. Ok - its late and the pain meds are making the room swirl so I am closing this blog entry now. Have a great weekend - and please, if you want to do some kind of homage to my invisible cat Fred in his memory - feel free. I'm sure he would be seeing it from Invisible kitty heaven and smile with the happiness of a happy cat, what is happy. I think.